Q: I haven’t done a triathlon yet. Can I join? A: Yes. We are keen to encourage and support first timers in getting to and completing their first race. A: This depends on what your aims are. As a member of the club the coaching team will be happy to give you general guidance and the sessions are structured across the year to build towards the race season. You can join in as many or as few sessions as you like. A: No. We aim to encourage participation and enjoyment of the sport and to do this in a friendly environment. Racing is not a requirement. A: Absolutely! The club is run by the members for the benefit of its members. You are welcome to come to a run session at the Arena on a Friday before joining, but if you want to keep coming you will have to join. A: See our membership page for details. A: We have swim sessions throughout the year (excluding Bank Holidays) at the Devon & Cornwall Police Training College at Middlemoor, Exeter. Sessions are on Mondays at 7pm and 8pm, and on Thursdays at 8pm. There are Open Water swim sessions during the summer months. All up to date details of our training sessions can be found through our website – on the training page. Q: The swim sessions are at Middlemoor. How do I get a pass to join in the sessions? 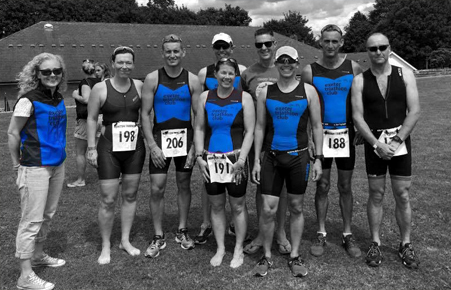 A: Once you have become an Exeter Tri Club Member, the membership secretary will email you an application form. Sports passes take approximately 5 days to come and you will need to wait to receive your pass before coming to the Middlemoor sessions. Q: Where is the Middlemoor pool? A: It is at the Devon & Cornwall Police training college. Map shows the location. If you use the Hill Barton Rd entrance (rear of Middlemoor Police HQ), and take the first right once past the guard to whom you must present your car and personal pass. Pool and gym are located on your left. Follow corridor right down and then turn right, pool is immediately in front of you, with changing rooms to your right. Q: What is the minimum standard of ability required to be able to join a club swim session? A: If you can swim front crawl for 100m (4 lengths of a 25m pool) at any speed without stopping you will be able to join in with the swim sessions. Coaches will be able to help you with swim technique, and sessions are triathlete specific, over 12 months of the year. Q: What if I can’t swim that well? A: As a club we can recommend basic swimming lessons with various people. Please contact the club swimming coach Rob Libby or contact your local pool. A: The open water sea swim sessions are on a Tuesday evening at 6.30pm in Teignmouth from June to September. We enter the water at 6.45pm, so you should aim to arrive approximately 15-20 minutes before this to allow enough time to get changed, sign in, collect wristband and coloured swim hat, pay (£3 members, £5 non-members (e.g. visiting triathletes or athletes trying us out). Car keys will be kept safe for you by an on land Safety officer. Q: Where in Teignmouth is the sea swim? A: We meet in the Point car park on the strand at the southern end of the seafront, close to the tower. Car Park is free after 6pm. A: A wetsuit is preferable for safety reasons, although if you have huge experience of open water swimming without a wetsuit, then you may join in the sessions, at the discretion of the coaches. Q: How do I know if the sea swim has been cancelled due to bad weather? A: If a session is cancelled it will be posted on exetertri.co.uk and our Facebook page. Please check this before making your journey. Q: Will there be a run after the sea swim? A: If there is an organised run this will be posted on the website as above. You can of course organise your own run afterwards with other members/swimmers – just post a message on Facebook page to gauge interest. Q: What is the minimum standard of ability required to be able to join a club sea swim session? A: Swimmers should be able to swim a minimum of 400 metres. We always have a Novice Groups which will cater for those less experienced at Open Water swimming and will show them the skills needed. There are usually another 3 groups of varying speeds who go out for a group swim, buoy to buoy, with a coach offering OW coaching skills. It is important that if people are nervous, or have never done any open water swimming before, that they should join the Novice Group for the first week or 2 until they feel confident to join a swim group. After-all, Open Water swimming is nothing like pool swimming! Q: Are there different ability groups? 1. Fast pace. This is for swimmers in Lanes 1 & 2 at Middlemoor. So 400m in less than 6minutes 40 sec. 2. Medium pace. This is for swimmers in lanes 3 & 4 at Middlemoor. So 400m in 6.45 to 8 minutes. 3. Slower pace. This is for swimmers in lanes 5 & 6 at Middlemoor. So 400m in over 8 minutes. 4. Novice group. This is for swimmers who are new to open water swimming or for those who lack confidence in this environment. Q: Are there any changing facilities? A: No we just change in the car park, but there are toilets about 100m away. Q: When and where are the organised bike rides? A: There are regular bike rides on Sunday mornings, meeting at Haven Banks, opposite Climbing Centre, at 9am. See training page for full details and contact. Q: When and where are the arranged bike rides? A: These are arranged though the Facebook page. These are steady road bike rides, mountain bike rides of off-road runs. These are all aimed at long steady activities with an emphasis on enjoyment and group training. Bike rides are always planned around a good café stop. Keep an eye out on Facebook for these organised runs and rides. Q: I’m really slow, will I get left behind? A: No. A more competent rider rides with the slowest group to ensure that no one is left behind no matter how slow you are. You are probably not as slow as you think. A: Absolutely yes. It is a requirement of club rides that you wear a helmet. It is also a condition of participating in all duathlon and triathlon races and bike time trials. A: The running sessions are at 6pm each Friday at Exeter Arena, Exhibition Field, Summer Lane, Whipton, Exeter Devon EX4 8NN. Q: Do I need to join SWRR to join in the Friday track sessions? A: No, it is a joint session led by the Tri Club. SWRR have a Wednesday session at the Arena and to attend that session you need to be a SWRR member. A: Run sessions are structured to ensure that no one gets left behind. There are normally 2 or 3 different groups for members of differing ability. Q: How much does a year’s membership cost? A: Membership is for a full year (February 1st to January 31st) costs £37 for full adult membership. There are two other categories: £26 for students in full time education, £21 for juniors age 16 and under (age as at 31st December). Q: It’s the middle of the year; do I get a membership discount? A: As all memberships expire on January 31st every year we do slightly reduce membership fees towards the end of the year. Contact the Membership Secretary. Q: Does my Exeter Tri membership give me automatic membership of the British Triathlon Federation (BTF)? Q: What other benefits are there to being an Exeter Tri member? A: There are some discounts available at some local sports shops and with some sports massage therapists.